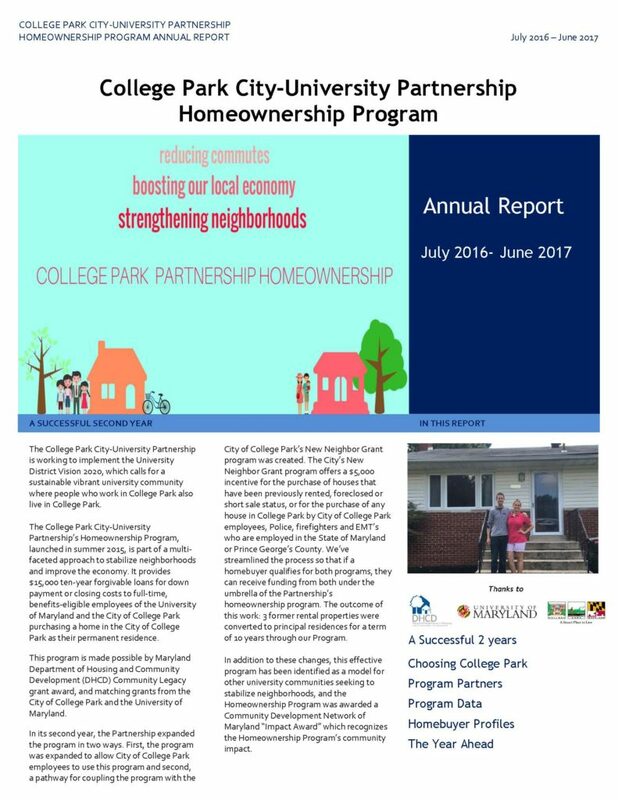 Made possible through a Community Legacy grant from Maryland’s Department of Housing and Community Development and matching grants from the University of Maryland and City of College Park, the City-University Partnership is pleased to release the FY’17 annual report of the Homeownership Program, documenting the program’s successful second year. The program is a core initiative of the Partnership’s Housing and Development Strategy, and part of an effort to increase the number of University of Maryland and City of College Park employees living in the City as outlined in the University District Vision 2020. It provides $15,000, in forgivable loans, to full-time, benefits-eligible University and full-time City employees to become homeowners in the City of College Park–ultimately reducing commutes, strengthening neighborhoods, and supporting our local economy. The College Park City-University Partnership is the nonprofit local development corporation sponsored by the City of College Park and the University of Maryland. The Partnership’s mission is to promote and support the economic welfare of College Park and the University of Maryland through activities including commercial revitalization, community development, and quality housing opportunities consistent with the interests of the City of College Park and the University of Maryland.